COCKTAIL DRINK MIXES WINTER SALE!!!!! FREE SHIPPING INCLUDED OUR BEST DEAL EVER! Finally, to tie us over until fun again at the beach, a cookout, and a few delicious cocktails. 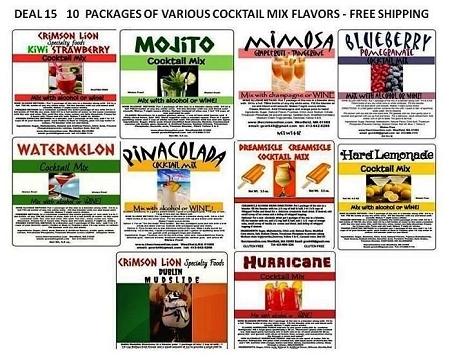 (10) Cocktail Drink Mixes/Wine slush mixes is one of our most popular deal packs and include FREE SHIPPING FOR ADDED SAVINGS. Regular price is $96.15 ($89.50 plus $6.65 shipping ) Our deal price is only $71.50 for a savings of $24.65 including free shipping. The flavors shown may not be in stock as these mixes are hard to keep in stock. If due to demand a flavor is not in stock we will contact you for other flavor options and/ or quantities. If you prefer a flavor not listed here please let us know and we will try to accommodate you. Each drink mix flavor includes a stand up labeled pouch with cocktail drink instructions.